The Carefusion Puresom (formerly Tiara) Ruby Adjustable Chin Strap features an adjustable Velcro strap system that allows a custom fit for a wide range of people. Patent pending, split-strap continuous flow design offers excellent stability and comfort. These chin straps work but they fit like a vise so if you have anything larger than an average size head get the Extra Large. While the quality of the chin strap is good, the fit was much much too small. I ordered a large after all! Thanks. I have been using the Chin Strap for over a week and it works fine. Next time I will order the larger size but this one fits. I purchased this chin strap to replace one that was nothing more than a single strap you wrapped around your head which kept falling off. This Puresom chin strap is so much better. It's more like headgear and stays on all night. It has made a big difference for me. I ordered the XL chin strap because the regular size (large) is now made smaller than it used to be and is too small for me (although the older ones fit fine.) This XL size was way too big for me but my husband was able to use it. These chinstraps are comfortable and don't slip around on your head ......IF you can find the right size. After using the chin strap for a few nights, I have stopped. I guess maybe it is too small, even after loosening it to the max allowable. It feels too tight and leaves those horrible strap marks on my face that seem to last all day. They need to have some sort of size chart or measurement as a guideline for choosing the right one. The larger one might have fit me better, If I'd known I would have ordered larger size. Have not had it long enough to rate. At this point I can say it is pretty to look at. The zipper is put in backwards from what the instruction show and say about installing. No big deal. Bought the standard and it was too small. Well made but of no use to me as is. This is by far the best chin strap I have tried. My wife and I both thank you. It does not move around and leaves my ears uncovered. Works well, have a little issue with it sliding up towards my mouth in the middle of the night, but it does the job. The chin strap is working well, it's comfortable, adjustable, and works well with my CPAP mask. This is indeed the best strap, and I have used many, that I have used. It is now the only strap I use. It is extremely well constructed and keeps my big mouth shut, comfortably. What more can you ask? When using a nasal mask, I kept opening my mouth in the deeper levels of sleep. Tried switching to full face (nasal/mouth) masks but two (expensive) masks leaked so much I kept waking up. Went back to the nasal mask and added this chin strap. Extremely comfortable, not hot, and leaves my ears uncovered. Given the small additional cost over other chin straps, this one is highly recommended. So far, the best chin strap that I have tried. Will reserve final opinion after I see how long it retains elasticity. I ordered the standard size which I find fits a little too tightly. Would order an x-large next time. Do I get a discount on my next purchase for submitting a favorable review? The best strap that I have used. Will be my next one also. 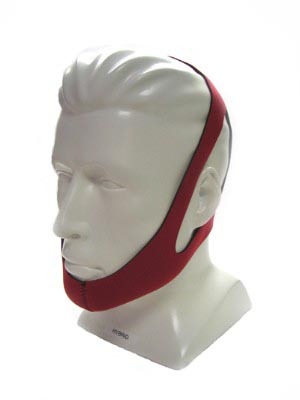 This item hits all the marks - it is the only chin strap that really is comfortable and easy to use. I would reccommend it whole heartedly.